Our family can easily be defined as being competitive... and had I of known Amanda's hubby was up to some crafty business this week I would have leveraged it to the max! You see unlike Amanda's husband's practical attitude toward paying a professional, my husband can't stomach the idea of not building something himself... sometimes in what people might consider an extreme way. 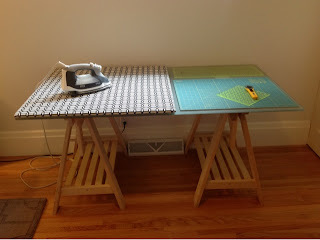 Just as an example to demonstrate my case, before I had even finished my very first quilt top, the hubs literally came up with a plan to build me a long arm machine... seriously, a long arm machine! I didn't even know what one looked like let alone how to use it but to this day he's still determined to make me one, and you know what... I just might let him someday! Throughout my craft room renovation quest, my husband has been a tremendous support to me. 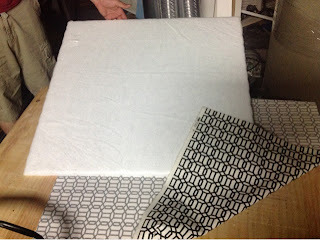 Not only in helping gather supplies, but also in the design process and follow through on many of my projects. I have big plans for this sweet little crafty nugget of mine, and I am fortunate enough to be blessed with one handy husband to help me bring all of my ideas into fruition. Last night after laughing about how he would have completed one of these ideas last week (if for no other reason than to beat Amanda's hubs onto our blog), he helped me polish off a table sized ironing board that I had been planning when the idea for a craft room makeover was just a seedling of thought. Here is how we made it happen. 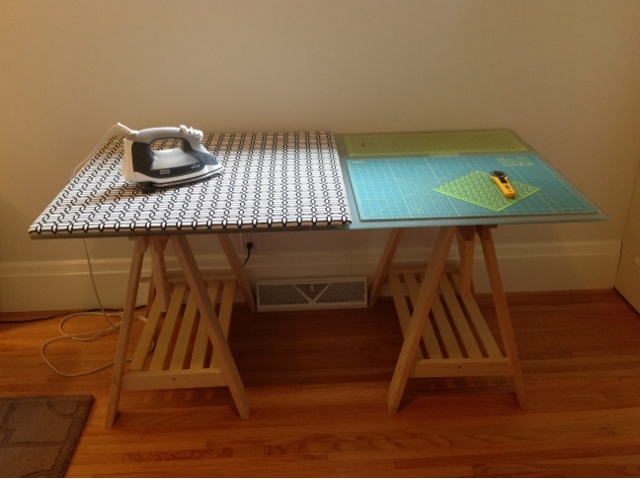 Step 1: I have a fairly large table in my new craft space for a dedicated work station for both cutting and ironing. 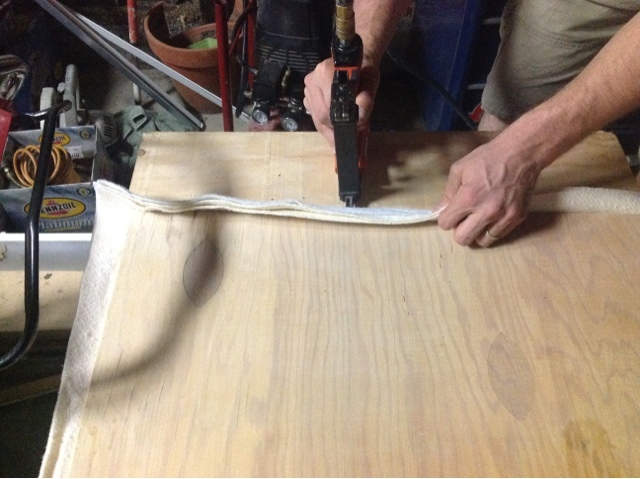 To maximize the pressing side of the table, I asked the hubs to cut me a board 30.5 x 32 inches. 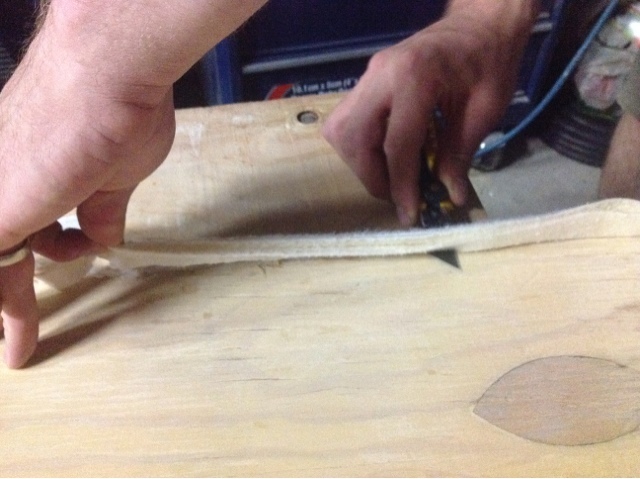 Due to the weight and size of such a board, he suggest we use 3/8" plywood. (Note: a handy husband was useful in my case, but is in no way required for this task - your local hardware store should make 1-2 cuts for free if you purchase your board from them). While the hubs cut the board and sanded the edges, I cut 2 layers of batting, 1 layer of thinsulate and 1 layer of fabric, being sure to leave roughly 4 inches of extra fabric on each side. Once we had our materials prepped, it was off to the garage to use the air stapler and air compressor (Note: for these next steps a simple hand staple gun would suffice). 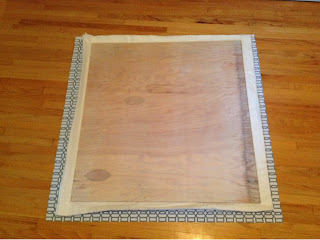 Step 2: Layer the batting and thinsulate layers over the pre-cut plywood (thinsulate layer on top). Now flip the project upside down so the bottom of the plywood faces up. Pulling the layers taught and starting in the middle of one edge, staple along one entire side of the board (stapling every 3-4 inches). 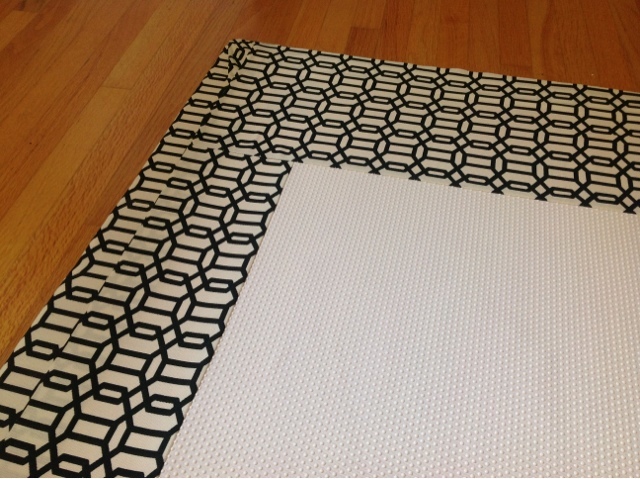 Once one side is complete, pull the layers smooth and staple the opposite side of the board. Continue this process until all four sides are complete. Step 3: Using a utility knife, rotary cutter or some sheers, trim back the excess batting and thinsulate so the back of the board is smooth (I appologize for the poor picture quality as we were in a dark garage at night). 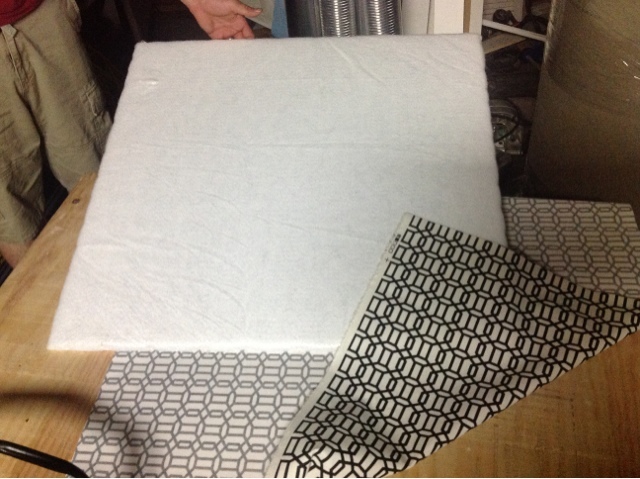 Step 4: Center your board on top of your home dec fabric (both good sides down). 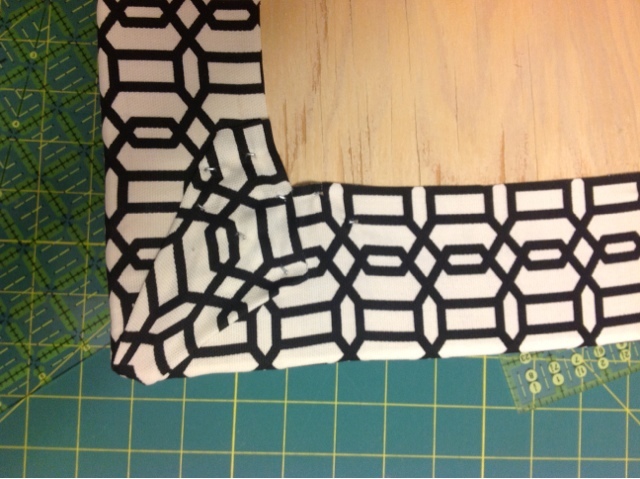 Pulling the fabric around the board to the back, staple the fabric using the guidelines in Step 1. 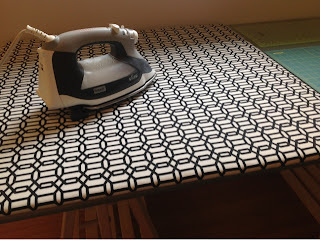 For this step it is important to note two things: a) you want to make sure if you are using a directional or geometric print that your pattern is straight at all times; and b) unlike Step 1 where you staple the side of the board, in this step we will staple fabric directly onto the back of the board. 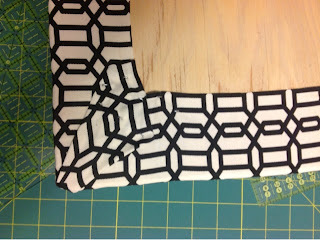 Step 5: Lay the excess fabric at the corners as flat as possible and staple them down. 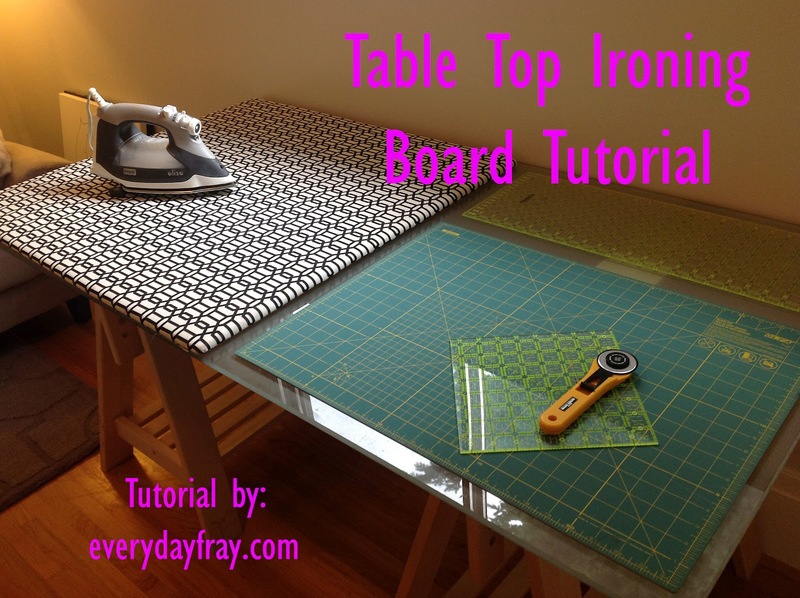 Step 6: (Optional) Because my table top ironing board is going to rest of a glass table top I wanted to make sure it wouldn't slide around. 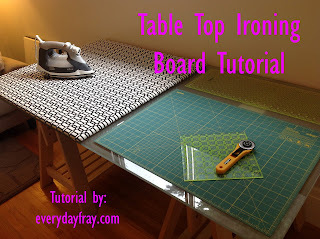 To help give it some hold on the table, I used some remnant fabric, along with some white jiffy grip fabric to cover the bottom of my board. To adhere this layer I used some all purpose craft adhesive spray however the verdict is out on the level of hold it will provide. I may be heading back to the garage for some staples instead (not as aesthetically pleasing but more functionally sound, and after all it's the bottom of the board). 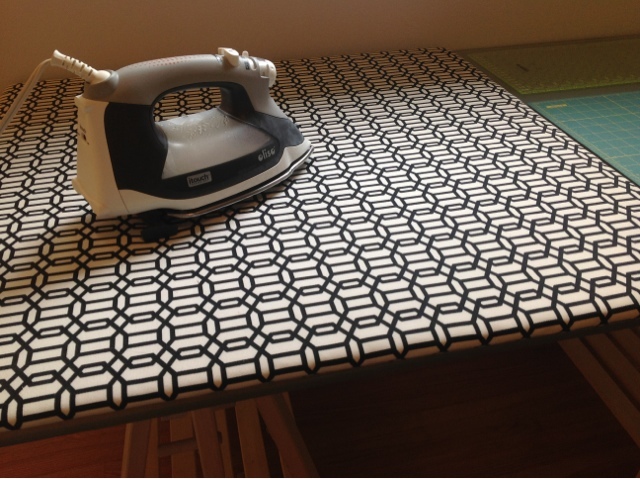 Step 7: Set up your board, plug in your iron, and enjoy! I hope you have enjoyed this mini tutorial and find it useful. 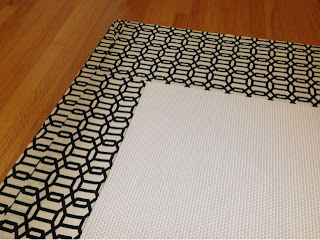 I know already how much I am going to love this mega sized board, and I can't wait until I need to press my next quilt top. Ahhh the joy that will be had!